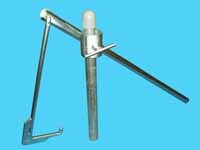 Dock Accessories | Dock Leveler | Dock Leveling Kit | VE-VE Inc. NOTE !! Dock hardware sizes refer to the pipes INSIDE diameter. 1-1/4”, 1-1/2” and 2” schedule 40 or 80 pipe, Have OUTSIDE dimensions of 1-5/8”, 1-7/8” and 2-3/8” O.D. The D-590; Dock Leveler is made of heavy duty steel and used to lift or lower your dock to changing water levels. Fits 1-1/4” (1-5/8” O.D.) up to 2-1/2" (2 7/8” O.D.) pipe. WD-76; Dock Winch Leveling Kit. Complete w/ Winch, Winch Mount Tube, Cable & Hook. Winch Mount tube slides over existing 1-1/4" ( 1-5/8" O.D. ) & 1-1/2" ( 1-7/8" O.D. ) Dock Pipe. Dock section hook ( J-Hook ) will work on dock frames up to 2" wide. NOTE: Optional, WD-76-12; "2 inch Pipe mount piece" available for 2" ( 2-3/8" O.D. ) Dock Pipe. CLICK ON DETAILS ( under Picture ) for more pictures & Info!